It’s the weekend, and for me that means that it is time for one of my hearty breakfast recipes. I have more time in the kitchen when I am not thinking about getting out the door in a hurry, and it gives me a chance to experiment with flavors and make something hearty and tasty for my family. These Breakfast Hash Browns with bacon and eggs are very filling and just loaded with flavor from the veggies and fresh herbs. 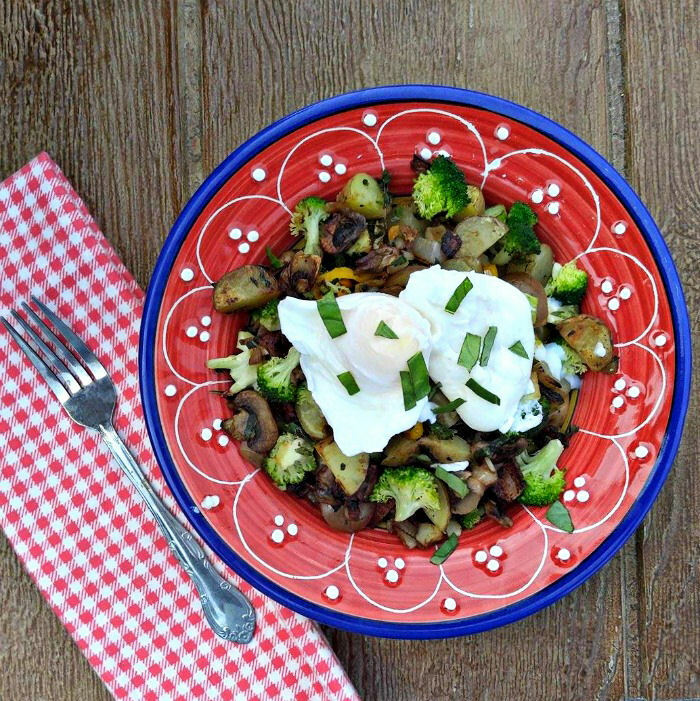 You won’t believe how easy these breakfast hash browns are! Fresh herbs are a key to the flavor of this dish. I have them growing on my garden on my deck all year long. 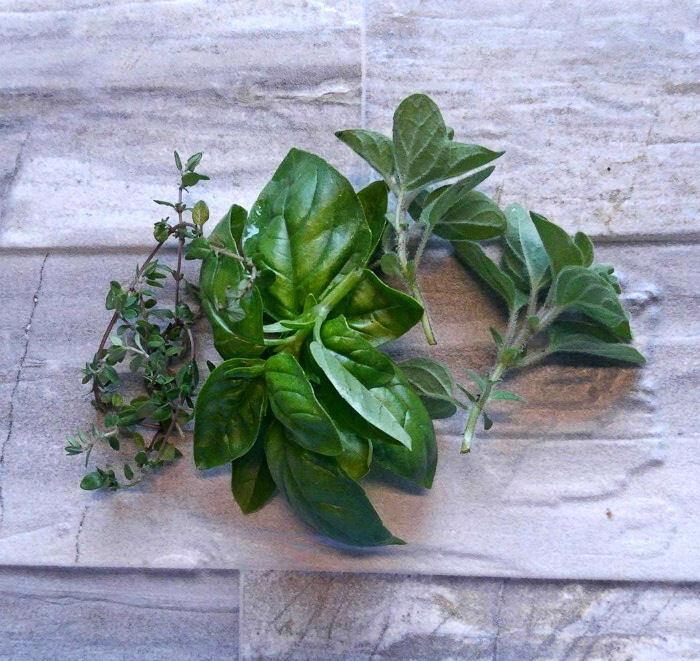 You can use dried herbs, (use 1/3 of the amount called for in the recipe) but fresh herbs are so easy to grow and make all the difference in flavor. Most grocery stores also sell fresh herbs in the produce department now, too. Cook the bacon and potatoes first. You can either do it in the oven to remove most of the fat, or on the stove top and drain the fat after. Chop the bacon and set it aside. Boil the potatoes in salted water and cook till tender. 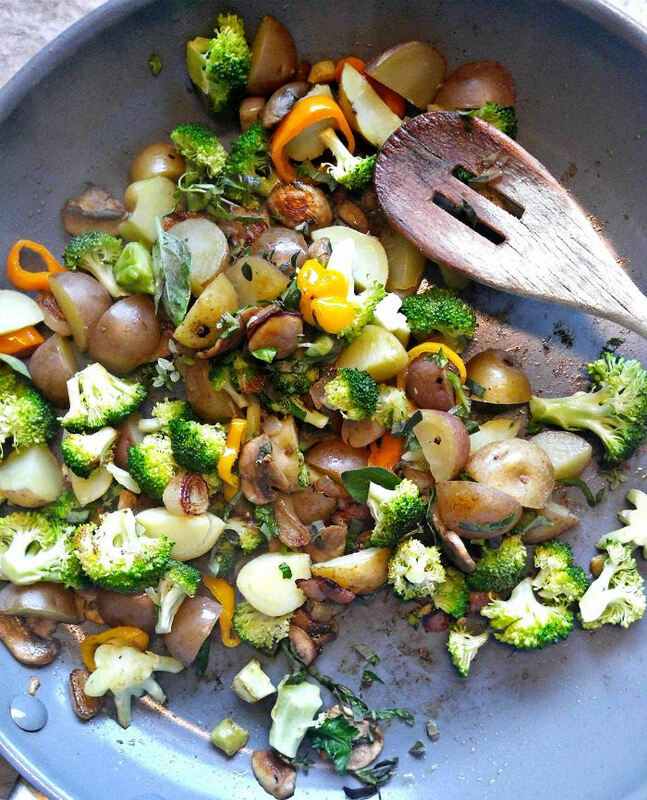 Drain and set aside while you cook the veggies. 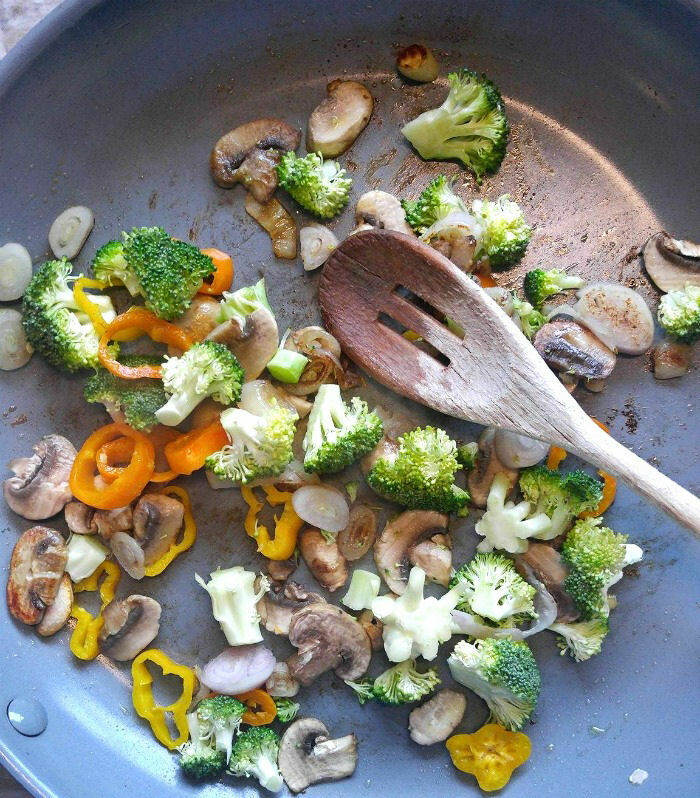 Mushrooms, shallots, sweet peppers and broccoli florets get cooked in olive oil until tender. 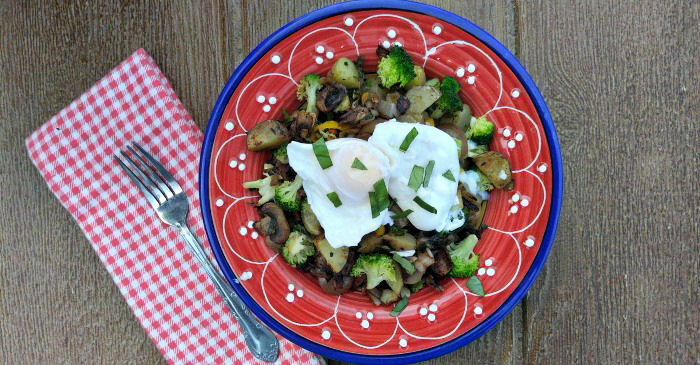 These nutritious veggies form the base of this dish, so you get the bulk from the dish here, without adding a lot of potatoes. The garlic goes in last, since garlic burns easily. Add the fresh herbs, crumbled bacon and cooked potatoes and season with sea salt and cracked black pepper. While you are cooking the veggies, put your pot of water on to soft boil the eggs. Add a bit of vinegar to the boiling water, slide in the eggs and remove from the heat for about 3 minutes for soft yolks. Add your cooked breakfast hash browns in a big bowl (it’s a substantial meal) and add the eggs to the top. A bit of fresh chopped basil adds the finishing touch and bit of extra garden fresh flavor. I like my yolks really runny so that the flavor of the eggs get into the breakfast hash browns with every bite. The flavor of these breakfast hash browns is just amazing. They are fresh and light from the vegetables, full of the flavor of home grown herbs and so hearty and filling from the addition of the potatoes, eggs and bacon. It is comfort food breakfast eating in a bowl. Your family will be asking for this again and again and since it is so easy to make, you won’t mind the request at all! 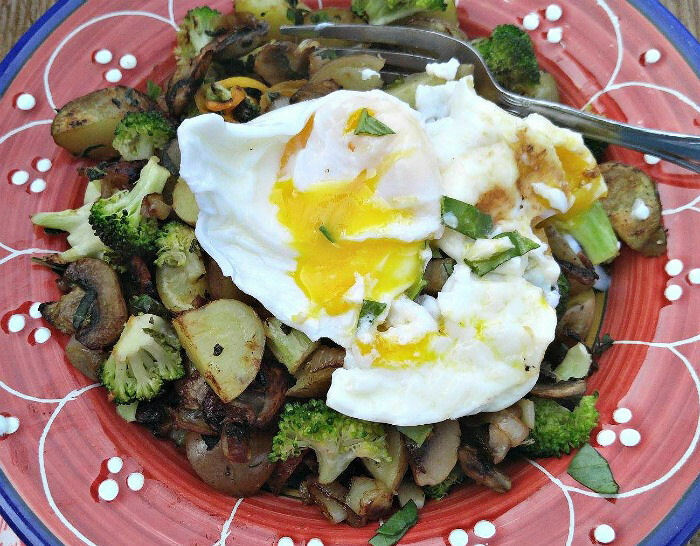 These Breakfast Hash Browns with bacon and eggs are very filling and just loaded with flavor from the veggies and fresh herbs. 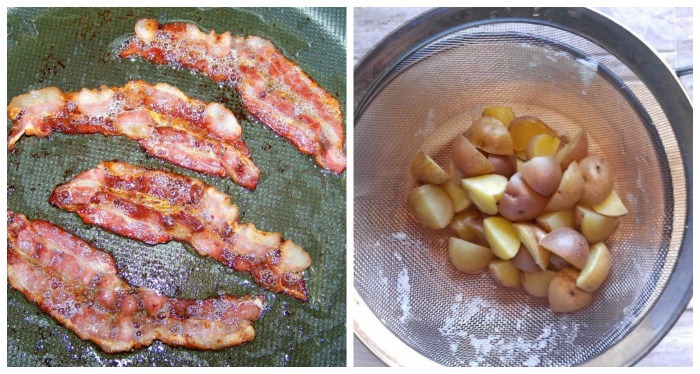 Place the baby potatoes in boiling salted water and cook until tender, about 8-10 minutes. Drain and set aside. Meanwhile, cook the bacon in a non stick frying pan. Remove to paper towels to drain, chop and set aside. Place the vinegar into a pot of water and bring to the boil. Gently spoon in the eggs and remove from the heat. Allow them to sit for 3 minutes for a soft yolk, longer if you like a firmer egg. Clean out the pan that the bacon was cooked in and heat the olive oil. Add the shallots, mushrooms and broccoli. Cook until the veggies are tender and the shallots are translucent about 3-4 minutes. Stir in the drained potatoes and season with salt and pepper. Add the chopped bacon and fresh herbs. Spoon into serving dishes and top with fresh chopped basil. Enjoy!